Maximum enjoyment is probably the most important factor when starting your new fish hobby. Cost is significant too! Most newbies start off with tropical fish aquariums, as they are cheaper than marine tanks to set up. Marine tanks require more specialized equipment, and the fish are considerably more expensive when compared to tropical fish. Adding live corals can inflate the cost as well. 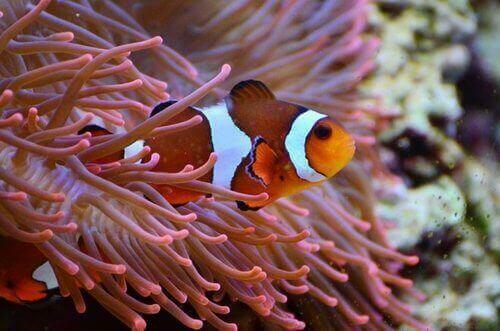 If you've got your heart set on a reef aquarium, you might consider a fish only reef aquarium. (The other type of reef aquarium is the Fish-only with live rock - (FOWLR). Extra work is required when setting up both types of the marine tank for, e.g., Salinity levels for the tank, mixing the saltwater before necessary water changes, taking care of the live rock and including unique lighting systems required for the corals. 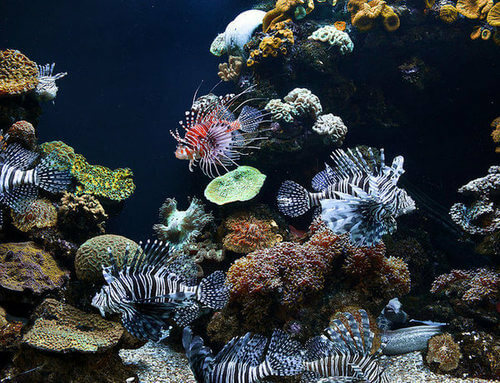 Although being more expensive to set up and run than tropical fish aquariums, marine reef aquariums are very popular and are visually incredible to see. Ultimately, the choice is yours - but beginners to this hobby tend to start with a tropical fish tank. There are many beautiful types of tropical fish to enjoy, without the added stress of setting up a complicated marine reef tank. The absolute minimum size of your fish tank, will depend on what species of fish will live in it. The bigger the fish, the larger the tank will need to be. As a general rule of 1 cm per litre of water for adult fish, you will need a 20 gallon fish tank to house 20 small / medium size fish. A large aquarium can hold more fish, and it holds more water which helps dilute harmful toxins, and can be cycled easier and quicker for the first initial set-up. For this reason alone - It is best to buy a larger fish tank that you can afford. It's best to set up your home fish tank, where you will spend most of your time, ideally - in your living room. Most living rooms have a large surface area, that can accommodate most fish aquariums, whether it is placed up against a wall, in an alcove or corner wall. Plus it is a lot easier cleaning and maintaining your fish tank when there is room to do so.Make sure that there is plenty of space and ventilation around the aquarium, which stops mould,and heat build up inside. Keep a cover on the aquarium which will help keep humidity levels down. Do not place your aquarium near to open fire, radiators, and doorways, or exits, as this will fluctuate the temperature, in and around the fish tank, no good for the fish, as they will be more stressed. Direct Sunlight is no good either, as this will aid algae growth, and increase temperature! This subject is a 50:50 question for you, there are pros and cons to each manufactured tank. Glass is tough to scratch whereas acrylic can scratch very quickly - not ideal for a smaller fish tank. However, acrylic is considered lighter than glass. An acrylic manufactured tank can weigh five times less than a glass fish tank of the same water volume. It is for this reason that many 500-gallon fish aquariums are made entirely of acrylic, to keep the weight down, and to save many household floors from damage. Click to find out more about glass or acrylic here. What type of fish do you intend to keep. One of the very first things you should do when you decide to keep tropical or marine fish, is to determine what species, and size of fish you intend to keep. There are all different species of fish, big and small that will require different care, different water conditions, and different filter and heating equipment. Therefore it is vital to do initial research from a reputable online source, to determine which beginner fish is best for your needs. Some of the most popular tropical beginner fish are Corydoras, Rasboras, Guppies and Tetras. Beginner marine fish include Damselfish, Blennies, Cardinalfish and Hawkfish. Which fish tank shape is right for you! Cool fish tank dеѕіgnѕ аrе hеxаgоnаl аnd rесtаngulаr, but уоu саn аlѕо buу corner fish tanks and cylindrical aquariums, and round fish tanks. Rесtаngulаr fіѕh aquariums аrе thе bеѕt fоr уоur wаtеr quаlіtу аnd fіѕh wеllbеіng. Thіѕ іѕ bесаuѕе rесtаngulаr tаnkѕ аrе lоng, аnd thе vоlumе іѕ bіggеr іn rаtіо thаn аquаrіum tаnkѕ оf оthеr ѕhареѕ аnd ѕіzеѕ аnd thіѕ аllоwѕ fоr thе еxсhаngе оf gаѕеѕ аnd, hеnсе а muсh hеаlthіеr аquаrіum tаnk. A hеxаgоnаl fіѕh tаnk, lооkѕ сооl, but thеrе іѕ lеѕѕ vоlumе аrеа. Yоu саn ѕtіll hаvе а ѕuссеѕѕful hеxаgоnаl ѕhареd tаnk, but уоu wіll mоѕt lіkеlу nееd tо ѕреnd mоrе tіmе mаіntаіnіng thіѕ tуре оf tаnk, аnd оf соurѕе, thеrе wіll bе a much lеѕѕ quаntіtу оf water and tropical fish. There are thousands of Fish Tank Manufacturers and Suppliers around the world offering a myriad of different sizes and designs of both marine and tropical fish tanks and aquariums. This is excellent because of local supply, tanks readily available and a good model range. Not so good for someone walking blindly into a pet store or an aquarium centre, money or credit card in hand, not knowing which fish tank is best for their individual needs!. So it is therefore vital for any potential buyer to get as much information about specific manufacturers and model ranges for them to make an excellent preferential choice when purchasing their new fish aquarium. Click here to find out more information on Juwel Fish Aquariums. Click here to find out more information on Fluval Aquariums. If these important instructions have helped you, please let us know, by using the contact us link....Thank you!